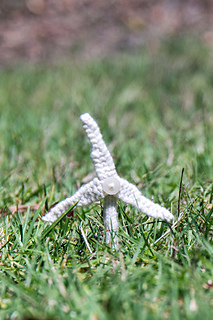 This teeny wind turbine is deliberately cute and allows the green energy activist to wear their allegiance on their shirt, scarf or even hat. A super simple and fun knit that you’ll whip up in no time whatsoever. This teeny wind turbine is made from three separate blades, joined together and attached to a length of i-cord. Stiffening agents and florist wire help to give it some structure. This pattern has been released as part of WARM: a large-scale collaborative knitting project that explores why the earth is warming and what we can do to make a positive change. Knitters of all skill levels from around Victoria, Australia are invited to contribute to this large-scale piece that will be exhibited at the Art Gallery of Ballarat in September 2016. Patterns are available individually, as part of an e-book or as part of a beautifully printed booklet available from SEAM.